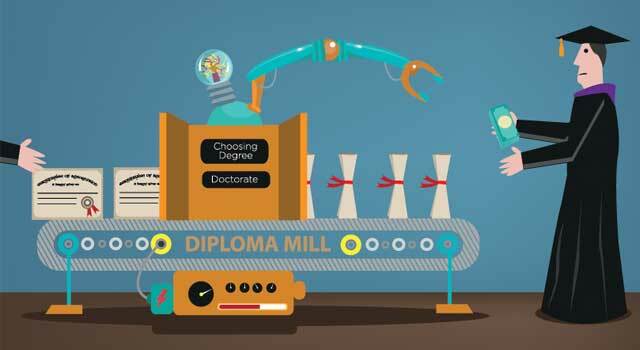 What do you need to know about degree and accreditation mills that try and take your money and leave you with bogus degrees? Along with students who choose to earn their college degrees from legitimate online colleges, there are degree scams and fake diplomas that threaten to take advantage of students who want to learn online, but who don’t recognize the scams. What can you do to avoid being educationally taken advantage of? Types of Degree Scams. Diploma mills, accreditation mills, and life experience degrees are all examples of degree scams. Accreditation Mills. Accreditation mills are organizations who allegedly provide higher ed accreditation to diploma mills that pay them for their services. They are not able to grant authentic higher ed accreditation because they are not recognized by the U.S. government or by mainstream academia. Life Experience Degrees. While you may be able to earn a limited amount of credits (for professional certifications or licenses, for example) that might add up to a few classes, you cannot earn entire degrees based on “life experience.” Therefore, if an organization states that you can earn a bachelor’s based on your prior life experience, do not give out any personal or credit card information. Consequences. The consequences of earning a “diploma” from one of these fake schools may be dire. You could set yourself up for credit identity theft, you could lose your job if your employer discovers your degree isn’t legit, or you could face fines. It’s not worth it. Online Accreditation Verification Services. Visit the U.S. Department of Education or the Council for Higher Education Accreditation (CHEA) to find out if a school you are interested in is accredited. There are also online resources that delve into accreditation and why it’s important. Report Fraud. If you are scammed, report the fraudulent organization . Visit the Internet Crime Complaint Center, notify the Better Business Bureau, let online forums know how you were scammed, and/or write a blog post about your experience to warn others. There are numerous legit online schools. Don’t let a bad experience with a bogus school keep you from earning your online degree.